OK yes yes, I do lurve me some bacon and cheese and all the fats, I do. But to give up my precious breads and bagels and sometimes desserts? Cannot. Do. It. Which is why I baked these bagels as an act of symbolic/edible protest (I’m so mature, go me). P.S. The writer also suggests not running as your sole form of exercise (“Don’t Jog”) and maybe not eating so much kale because we can’t digest all of the nutrients from it that we think we can. Or something. I’m not exactly sure because I haven’t read it and I’m just going by what my husband said he read in the preview, but it’s enough information for me to stress-eat another bagel with double the cream cheese. ANYWAY, let’s talk about happier times and things like bagels. Specifically these bagels, which I am officially declaring as my new favorite homemade bagel recipe. They’re chewy, with crunchy toasted walnuts and sweet-tart dried cranberry jewels tucked inside and each bite is like a flavorful, carbo-full heaven. AND OH HEY there’s whole wheat flour in there, too, and I used lower sugar dried cranberries — for the health! If you haven’t made homemade bagels before, I really cannot stress enough that now is the time to do so. 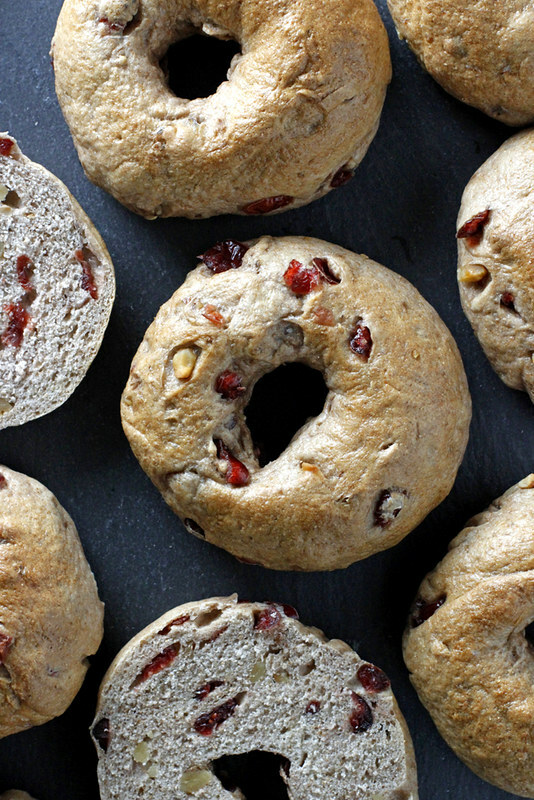 There is nothing better than a homemade bagel, truly — they’re denser, they’re chewier, they have more flavor per bite and I like to think they’re better for you, too, because you made them from scratch. 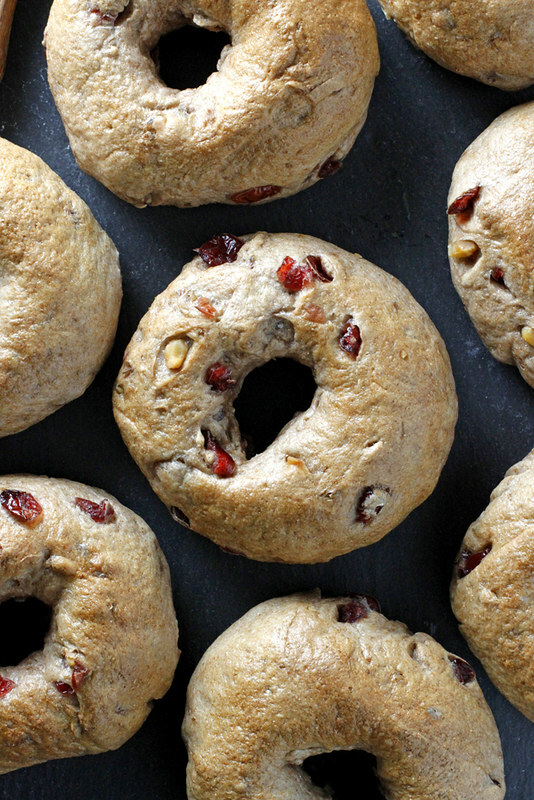 These in particular, what with the combination of toasted walnuts (← toast them, pretty please, it’s so much yummier) and tart cranberries that lends a perfect complexity of texture to the bagel, are oh-so-extra-delicious. And they’re easy-peasy to make, too: it’s actually kind of ridiculous just how easy. If you’ve got a couple of hours in your day (most of which is spent letting the dough rise and bake/catching up on episodes of “Parenthood,” P.S. whaaaaaat is happening there), use it to make these bagels. You will not be sorry. I’ve been eating these for breakfast toasted with cream cheese and sometimes with a drizzle of honey, but also for lunch as a sandwich bread with turkey and slices of havarti. I’m currently having future visions of pressed bagel grilled cheeses, too, or bagel bread pudding/strata. Or bagel croutons on a salad with candied pecans and goat cheese? Or bagel French toast?? I can’t even deal. And this is why I can’t give up the carbs. That, above? My life every morning from now until Christmas (because on Christmas it will be cookies, obvi). In a small bowl, combine yeast and sugar. Add 1/2 cup warm water. Let sit 5 to 10 minutes until foamy. Meanwhile, in a large bowl or bowl of a stand mixer, stir flours and salt to combine. Pour in yeast mixture and another 1/2 cup warm water. Stir, adding just enough of remaining 1/4 cup water until a dough forms. Stir in dried cranberries and walnuts. Transfer dough to a lightly floured surface. Knead in any extra dried cranberries and walnuts that didn’t get stirred into dough. Knead dough by hand 10 to 15 minutes until smooth, soft and elastic (the windowpane test, which I mention here, works really well to know if it’s fully kneaded). Shape dough into a ball and place in a large, lightly greased bowl; turn to coat. Cover with plastic wrap or a tea towel and let rise in a warm place 1 hour until doubled. Punch down risen dough; let rest 10 minutes. Meanwhile, fill a large, wide pot two-thirds full with water. Heat water to just below a simmer. Heat oven to 425 degrees F, and line a baking sheet with parchment paper or a silicone mat. Bake until golden brown, about 15 to 20 minutes. Remove from oven and let cool completely on a cooling rack before slicing. Anyone who tells you to eat less carbs AND no kale is really just delusional. That’s all I have to say on that. Yay bagels! Perfect for Xmas morning. Hahaha just hearing about the book is stressing me out!! Why! I’ll just go ahead and cope by obsessing over these bagels because OMG. These are perfection! Carbs, carbs, carbs for-EVA!!!! Though I’d eat this bagel with a side of bacon. Does this mean I’m invited for breakfast? Everyone that tells me my consumption of bread and is doing my waist line wrong; I hit them over the head with a baguette . For some of us carbs will not be the devil’s work but a blessing in edible form! Bagels are love, always, full stop. Perfect with cream cheese for a salty sweet breakfast! Never to many carbs! These look so good! Bring on the carbs! At this point, I’ve basically just given up and given in to the month of December. Cookies! Cakes! All the things! It’s just gotta happen. These bagels look delicious! Yum! I wish I was eating one of these right now. They look awesome! Totally making these for my family!! I totally want to read that book! I’m a uuuuuuuge believer in healthy fats through meat and high quality oils, and have recently come to the conclusion that no matter how much I run, I always feel stronger when I do ridiculous body weight floor exercises. I hate doing them, but I do them nonetheless, because: muscle tone. Anyhoo, I’m going to look this book up and read it while I eat a cranberry walnut bagel. The photo with the newspaper? Love it!! I could stare at that photo all day! You don’t even know how badly I am craving allthecarbs at the moment and I basically want to inhale one of these beauties in 5 seconds flat ;). Yay, bring on the carbs! I still haven’t made homemade bagels before but yours look too good not to! Love the whole wheat and cranberry walnut combo! They look amazing! I’ve never made bagels before, but I want to real bad. I thought they would be complicated, but this recipe looks so approachable. Doin’ it! You need to run, not walk, run away from books with titles like that! Every carb is sacred and we need to fight against weirdo anti-carbers with delicious bagel and cookie recipes with every chance we get! Can’t wait to try making a GF version of these over my break! Carbs my dear is the correct answer. Not more bacon. Unfortunately I probably will never make a bagel. BUT boy howdy I would eat one of these in a minute. I love it. Oh yeah, need to smear it thickly with cream cheese. WHAT?! Give up carbs? NO WAY. Can’t and won’t do it. Although I do condone more bacon eating for sure. I’ve never made homemade bagels, but they (along with a 1,000 other baked goods) have been on my list to try out for an eternity. THESE guys are pure carby heaven! Hi there, can I use all purpose flour or cake flour instead of the bread flour (I don’t have any on hand). Thanks! 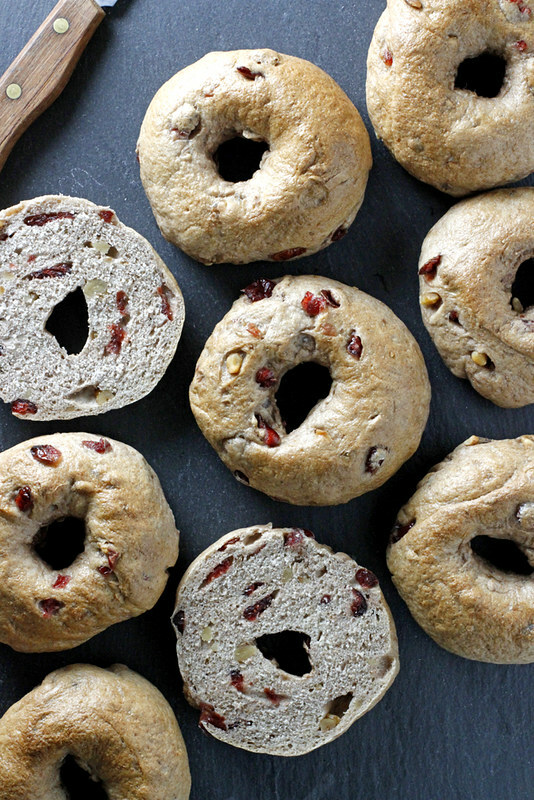 Rita — Bread flour is really best for bagels because it helps them hold their shape, but you can try using all-purpose flour (I just can’t guarantee the same results). I love making bagels but it has been far too long! What a great flavor combo here. Reminds me of a cranberry walnut bread I made last year. Yum! Oh my gosh. I’ve been wanting to make bagels but I couldn’t find the recipe I wanted. You are AMAZING because this is exactly what I’m looking for!! My favorite restaurant serves a chicken salad on cranberry walnut bread which is my fave. But then in bagel form? OMG. Making these as soon as possible!! Leigha — Yay for bagels! Merry Christmas! 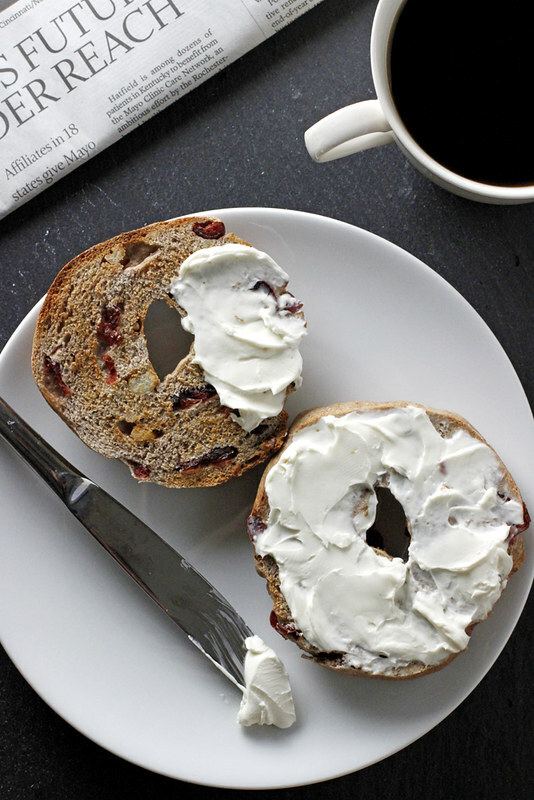 Cranberry bagels are my FAV. I’ve never made my own before but your pictures have me craving one right.now. so I just might have to. Gorgeous, Steph! Long live carbs! I’ve only made bagels once before, and I was a little disappointed, but these look awesome and have two of my favorite flavors. Can’t wait to try them soon!